KwaZulu Natal holiday rentals will take you to a variety of landscapes and people. Book your guest farm, holiday cottage, or farm Bed and Breakfast through our holiday listings. In this province you will find the indigenous Zulus, old families from pioneering days who can trace their ancestors from England, and a large population of Indians, who were brought over many generations ago to help plant sugar cane farms. A farm holiday in KwaZulu Natal will give you the rolling hills of the Natal Midlands with such towns such as Mooi River, Estcourt, Nottingham Road and Ixopo. It is a very lush, fertile and green area predominately, but not exclusively, made up of dairy farms and pig farms. It is here in places like Ladysmith and Spionkop that the Boers met the English, and the Zulu Impi warriors encountered and fought both. The mass graves still seen on fields outside Ladysmith are a sobering and moving encounter. The backbone of this province is the imposing Drakensberg Range that has several different names, depending on the culture. To the Zulus it is called uKhahlamba , meaning "the Barrier of Spears", to the Afrikaaners it's called "Dragon's Mountain". 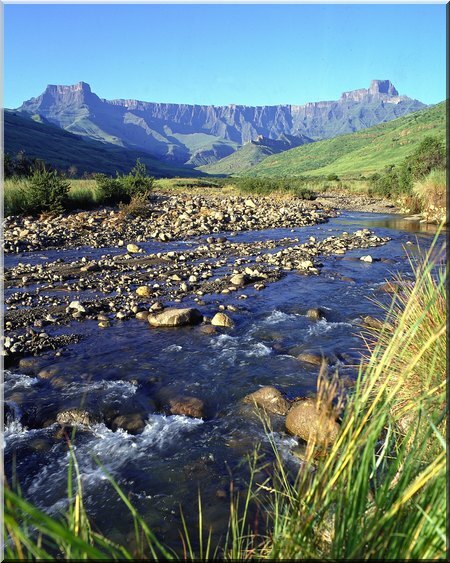 The Drakensberg Range runs for 200km, much of it lies in the KwaZulu Natal region. It is now a world heritage site and a much-loved hiking and climbing area for both the locals and overseas visitors. The Drakensberg Ampitheatre, as seen above, is a huge sweeping arc of basalt rock measuring 4 kms across and 1000m high. There a fields of wildflowers in the spring, a plethora of birds and caves showing rock art. At the foothills of the Drakensberg are lovely towns like Himevile, Underberg, Winterton and Bergville which are mainly farming communities and are worth a visit and a stop-over if you want to explore lovely scenery, rivers, go swimming, horseriding or do a little spot of trout fishing. Further south is the Valley of 1000 Hills, a spectacle of undulating hills and valleys that go on, and on, as far as the eye can see - thus the name! It is a special area which is heavily conserved by some 15 Nature Reserves. The Shongweni, Kranzkloof and Nagle Dam Nature Reserves are the three main reserves in the area. Shongweni offers a nature trail, game drives and horse riding. There is a wide variety of game and it is noted as being one of the top bird sanctuaries. The reserve is 1700 hectares in size and offers fine examples of many habitats including grasslands, valley, bushveld and spectacular cliffs. Kranzkloof Nature Reserve is a small reserve that has areas of both grassland and forest. It is very rich in fauna and flora. Antelope such as impala, grey and blue duiker and many species of bird life may be seen. It is also a popular rock-climbing venue. If you want to see and experience the Zulu culture than you should not miss a trip to the Phezulu Safari Park. Here you can see a replica of a typical Zulu village with beehive shaped huts. A visitor can gain insight into the lifestyle of the Zulus and see their living quarters and utensils. A typical Zulu dance is performed at the arena for visitors and a traditional lunch is served afterwards. Finally in the KwaZulu Province we come to the coast. The coastline is beautiful, from north that borders onto Mozambique or to the south, bordering on the Eastern Cape Province. The northern coast is known as Dolphin Coast because you can see dolphins in this area on a regular basis. Many of which often swim with the surfers through the breakers. In the north you can find Game Reserves such as Hluhluwe and Mkuze and the spectacular coastal reserve, St. Lucia. Durban is the biggest city of this province and offers great surfing opportunities to surfing enthusiasts. It is a vibrant city that has a lot to offer the overseas tourist. On the southern coast one can see places like Margate, Ramsgate, and a beautiful little spot on the very border, Port Edward. Throughout KwaZulu Natal you will find a lot of holiday rentals on offer from guest farms, private game farms, farm Bed and Breakfasts and self-catering cottages. It is a wonderful and beautiful place to visit, steeped in history and blessed with wonderful scenery. Come to KwaZulu Natal for your next farm holiday! If you have a farm in KwaZulu Natal that you would like to showcase visit our Farm Forum. You can upload a picture and brag a little. We don't mind! Share a farming story, tell us about your best or worst farm holiday and lots more. There are other individual farming discussion boards to contribute to through this forum, as well as a Craft & Recipes Forum where you can share your favourite recipes and also get some crafting ideas for various arts & crafts. If you are looking for posters on KwaZulu Natal, or just posters in general then search here and see if find something of value. There are at least 80 posters on KwaZulu Natal alone, and thousands of posters on all sorts of categories.